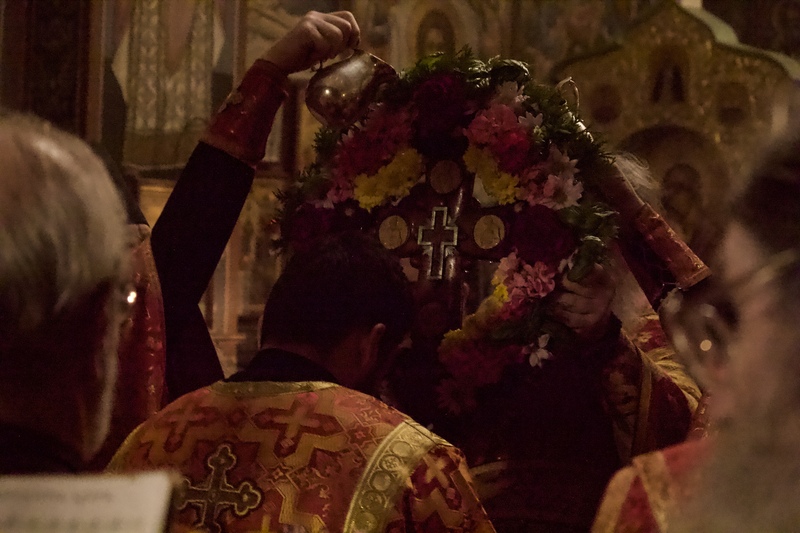 On September 26th the usual vigil for the great feast of the Exaltation of the Lord was served with its highlight being the service of the Exaltation or Elevation of the Cross. Usually this service is performed by bishops in their cathedrals, but it can also be done by archimandrites. One of the most precious relics that our monastery has is a piece of the Life-Giving Cross of the Lord. We actually have a couple of pieces, both inserted in two separate crosses. One is used for the Adoration of the Cross on the Third Sunday of Great Lent. The other one, the one used for the present feast, is contained in a pectoral cross once owned by Archbishop Averky of blessed memory, a previous abbot of our monastery and a well-known homilist of the Church Abroad. The Cross is decorated with flowers and basil. At the appointed time, at the end of the Great Doxology, Fr. Luke, assisted by the monastery clergy, brought the Cross out of the altar and after blessing the faithful with it, proceeded to the center of the church, where a special analoy had been prepared to hold it. After singing thrice the chant, “We venerate Thy Cross, O Master,…” the exaltation took place. A large bowl containing a multitude of cut marigolds and basil was placed under the Cross as it was at first lowered and then raised up high with the choir singing “Lord have mercy” a hundred times, in all four directions and then a final time facing east. At the same time, two priests slowly poured rose water over the Cross, which flowed into the basin below. After this, all came forward to venerate the Cross, be anointed with holy oil and receive a small bouquet from the basin. This is the first time many of our new seminarians have witnessed such a service, which made a great impression on them. 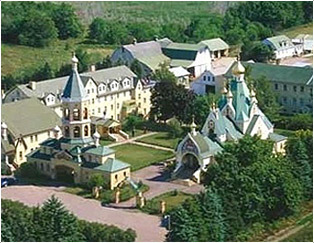 In the morning, the Divine Liturgy, as usual, was served at 9 AM. Glory to God for all things!